In previous Tutorial we discuss different methods. But just knowing how these methods work and use them separately is not all, implementing these methods together in a project and make your website awesome is a real challenge, which take many hours, the problem with this, is that too many hours in the computers is prejudicial for health so we also recommend being active and exercising using equipment as the URBNFit Exercise Ball, and we’re going to try to do the tutorials shorter. In this tutorial I will show how to create a different project by using simple jquery methods. In this way you have a solid idea how to create a project that’s meets demand of your clients. We are going to create a slideshow, vertical dropdown menu, image zoomer, animation and so on. You will be wonder after this tutorial that how we can create a awesome jquery project just using simple methods. Within the framework of the streeter basic stationary kart stand, an essential step into the future will be held in the racing season 2018. This is the first step towards to the animation of the Jquery.This is the first step towards to the animation of the Jquery. Explanation: We have a div whose id is animation. By css we hide this box just giving margin-left minus 350px.So it will hide in left top side of webpage. Then this box gradually enters into webpage after 4 seconds because setTimeout function run after 4 seconds from document load. In this function we call animate method which will set margin-left from -350 to 50 over the time of 5 seconds. Now Visitor can close the box by click X .When X is clicked we run a click event and inside this we run animate method again which will set margin-left:-350px and make it opacity half over the time of 3seconds.When animation done then a function will run which append a h3 into body. Load data from the url and place the returned HTML into the matched element. laod() takes three parameter. data : which part of that webpage you want l(ike a specific tag,id or class). Complete: A function will run when loading complete. 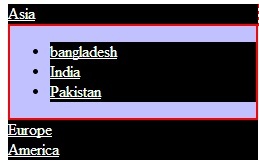 Below dropdown menu have perfect example of load method. Explanation: we give parent anchor tag a class called holder. When visitor clicked this parent tag box with class item will show up. Second time when visitor click another parent menu immediately, we have to close previously open item. To do that close all item but not current one by using not method. Selector under not method will be out of selection. In item box ,when visitor click page link we prevent default behavior by using preventDefault().To use preventDefault() we have to pass a argument in function like pageX,pageY,which,type. Finally grab clicked anchor tag href and pass this to load method which is responsible to load content for content class from the anchor target page. On the other side, To make currently clicked anchor active we add a class to current anchor tag and remove active class to others anchor tag but not current one. // below selector is equal to .1 ,.0 and so on. //this slider function will run every 5 seconds.But start after 5 seconds from page load. Remember it runs each 5 seconds after until browser is closed. Height(): return currently selected element or tag total height. Width(): return currently selected element or tag total width. Resize(): will run each time when browser is resizing. Ready(): when browser complete rendering html. After that , this will run. Explanation: Create a function called layout and write all of our logic inside it. Firstly we have to check window height and width. Then run three if condition to check what is the current width of window. If current width is greater than 750 then we just load style.css file by changing link tag href attribute. Same work is done in table and mobile view. Finally we run our function first when document is ready or just complete rendering. Then each time browser resize we run our function by using resize method. Changing the right click on webpage. Generally, we see a context menu when right click on webpage. This menu option varies from browser to browser. But instead of context menu we can set our own menu bar by preventing default behavior of browser. Evt.type: will tell you what event like click, keyup, keydown, blur happened. Finally, hide our context menu when move leave from context menu box. This method work only when try to close web page. Add the following code to any webpage to show an confirm message before close. Just add this piece of code to your webpage to prevent copy content. You can make your webpage secure by preventing default context menu and copy. This two option are very helpful when you creating a exam system where examinee should not copy question from webpage. So they cannot search it to Google and other search engine for answer. Moreover, they also unable to view page source normally. That would be the practical use of two techniques. Go to http://jqueryui.com/menu/ and from footer copy jquery-ui cdn. You must have jquery library prior to jquery-ui cdn. You can also use jquery-ui themes.But it optional. 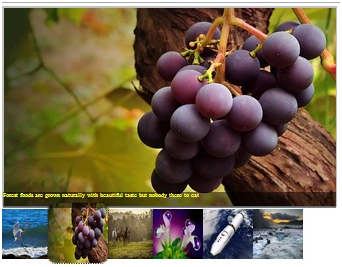 Like Jquery UI there are other site you can get similar ready product for your webpage. Gvalidate is a powerful and nice way of validate client side form.It have nice features. Download gvalidator and see examples and learn from there how to use in your form. Just add gvalidator.js into your web page and its ready to validate your form.Do not forget to add gform class on form tag.You have to add class into input field based on your requirement. See the below example carefully. Now are are no more beginner in jquery.You learn how to create menu bar,slideshow and other.Now you have solid knowledge to build any jquery plugin for your website.In the next tutorial we discuss jquery ajax methods and their implementation in real life. Hi,I am Tuhin Bepari from Bangladesh. I am a freelancer since 2011 working on odesk. I am not from Computer science background. But my passion about web programming make me a web developer. I am self motivated and always try to update with latest technology in my field.Now I am working on Yii Framework and Mongo DB.I have two other blog one is higher php and another is learn html5.